Climb up Mt Diablo via North Gate Rd to the Junction Ranger Station and continue on Summit Rd to the top of the mountain. The steepest section on North Gate Rd is about a quarter-mile stretch with 9-11% grades on the approach to the 1000′ elevation sign near the Burma Road Trail and a bit beyond. North Gate winds up from Diablo Ranch around the switchbacks to the trail at Angel Kerley Rd. 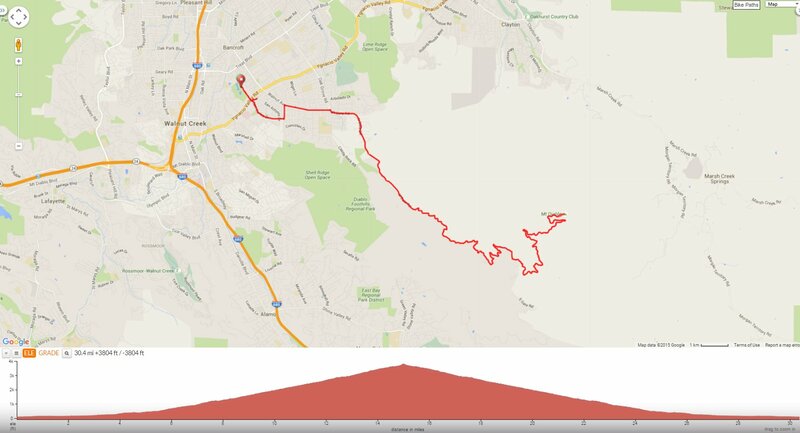 Summit Rd up to Mt Diablo summit is 4.5 miles with an average grade of 7%. Livermore Valley Overlook to Toyon Picnic Area. There is a steep 9-11% climb from Toyon Picnic Area to Grapevine Picnic Area. The road eases up from Grapevine Picnic Area to Juniper-Diablo Valley Overlook. Mt Diablo summit-enjoy the spectacular views! I enjoy climbing up Mt Diablo-it’s one of my favorite local rides! I usually make it up at a quiet slow-poke pace to soak in the quiet calm of the mountain and the majestic vistas. Weather: Overcast grey skies with low-lying fog. Cool temps ranging from the low to high 50’s with NE winds.